Leo (♌) is the fifth astrological sign of the Zodiac, starting from the constellation of Leo. Leo is considered to be a "masculine", positive (extrovert) sign. It is also considered a fire sign and is one of four fixed signs  ruled by the Sun. Being the fifth sign of the zodiac, Leo has been associated with the astrological fifth house. Individuals born when the Sun is in this sign are considered Leo individuals. The Sun is in Leo roughly from July 23 to August 22. Under the sidereal zodiac, it is currently there roughly from August 10 to September 15. Generally, people with the starsign Leo are thought to be compatible with people of the other fire signs, Aries and Sagittarius. They are also compatible with people with an air sign: Gemini, Libra and Aquarius. Taurus and Scorpio are signs of the other nature (feminine/introverted), but are said to be semi-compatible with Leo because they have the same fixed quality. There are many variables that determine compatibility in astrology, such as birth dates, birth months, personalities, birth years, times of birth (specific), position of a sign within the Sun, the Moon, Stars, etc. The signs listed as compatible are a general guideline and reference to compatibility. The branch in astrology dealing with specific interpersonal compatibilities is called Synastry. Leo's are generous and veritably loyal. They intrinsically exhibit dignity and duty towards individuals and their values. Regardless of their financial status and need for work, Leos are extremely energetic and will constantly keep themselves active. ↑ 2.0 2.1 "Leo Traits". 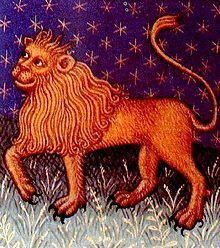 Wikimedia Commons has media related to Leo (astrology). This page was last changed on 13 April 2019, at 15:56.